Dogs are irreplaceable members of the family. But while their unconditional love and loyalty is unmatched, providing them with the care they need can get expensive. From food to leashes to vet bills, the cost of taking care of your furry friend can get very high. Dogs love toys, but toys are typically at the bottom of the priority list when budgeting for your pup. Our article discusses some of the best cheap dog toys for owners who want to keep their dogs happy without breaking the bank. There is a wide variety of dog toys that fit many needs. Some toys are specifically used for games of fetch, like balls and Frisbees. Some are made for games of tug-of-war between two dogs or between a dog and his or her owner. These toys are typically made of colorful rope. Many dog toys are made for chewing and gnawing. These toys too come in a variety of shapes and fun colors. Some are stuffed, some are made out of hard rubber to withstand aggressive chewing, and some even come with squeakers inside. Whatever types of toys your dog likes, it is important for the toys to be durable and manage to keep your dog entertained. 2. Why Are Cheap Dog Toys Preferred? Cheap dog toys are preferred by frugal owners because many dogs work their way through toys quite quickly. When toys can be chewed up and disposed of within a few days, it makes more sense to spend less money on them. What's more, dogs should have multiple toys so that they won’t get bored. You could be netter off buying several toys at lower prices than one or two very expensive toys. 3. Where Can You Buy Cheap Dog Toys? Each entry on our list can be purchased online on Amazon.com. Amazon tends to have the lowest prices and best variety. Toys can also be bought in pet stores or brick-and-mortar stores like Walmart and Target. Our review of each of the cheap dog toys on this list is based on the toy’s various features, its pros and cons, and its price. A major feature we focus on for each toy is its durability. Other important features are the materials used, the toy’s appearance, and the toy’s versatility. This stuffing-free toy is made of a polyester plush fabric, shaped into a flying squirrel. The stuffing-free design will make the toy last longer as dogs will not be compelled to rip it apart and scatter the stuffing. This design also reduces mess and waste. Instead of stuffing, the inner lining is made of a crinkle paper that makes a satisfying crunch sound when your dog bites into it. This sound can be less distracting and annoying than the traditional squeaker. As the toy looks like a squirrel, it will satisfy your dog’s natural instinct to hunt. This toy can be used for games of fetch or tug-of-war, but it is not well suited for aggressive chewers. This cheap dog toy is perfect for aggressive chewers. It is made out of a durable nylon material and has a chicken flavoring that dogs love. The chew toy’s shape and material will keep your dog’s teeth clean and reduce plaque buildup. While this toy is great for chewing and can be used for games of fetch, it is not well suited for tug-of-war. Dogs who are left at home for long periods of time will find relief from their boredom with this toy. They can also redirect their destructive chewing habits toward this toy rather than toward your shoes or furniture. 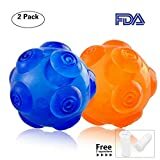 These colorful dog balls which come in a 3-pack are made out of thick and all-natural rubber. They are also completely safe for your dog to chew on as they are BPA-free. These balls are perfect for outdoor play like games of fetch, as they are easily machine-washable and easy to spot clean. Also, the Snug rubber dog balls are well-suited for powerful chewers thanks to their durable material. While this toy is one of the more expensive ones on our list, it is still cost effective as each pack contains three balls. This toy comes in a set of two. The toys are made of a plush polyester exterior shaped into a pair of cute lambs. These toys are stuffed with polyester stuffing and a squeaker. They can be used for games of fetch, but be warry that games of tug-of-war and bouts of chewing will quickly destroy the plush exterior. The toy also isn’t suited for outdoor play. While dogs love to tear the stuffing out of toys and squeak their squeakers, the mess made and the annoying squeaking can be not as enjoyable for owners. 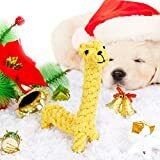 This cheap dog toy is a colorful woven rope with a large knot on each end. Rope toys like this one are perfect for dogs that love tug-of-war and solo chewing. The rope can be very beneficial for a dog’s gums, but expert chewers may make a huge mess from tearing off pieces of rope and string. The combo of colors looks fun and aesthetically pleasing for owners and dogs alike. While these toys are generally durable, they are not well suited for both outdoor and indoor play. They are not machine washable and will just be used to bring dirt and debris indoors. In addition, out of all the cheap dog toys on our list, this one is the cheapest. SUITABLE DOG SIZE:Works well for the all size dogs joyful interactive training playing.dog ball and pet train. This bright and colorful toy is made of durable and non-toxic rubber. While it is recommended for small to medium dogs that love to chew, it is not recommended for large or aggressive chewers like bulldogs or pitbulls. The various ridges on the ball make it an exciting ball to chase after in games of fetch. Its easy to clean, and rubber exterior makes playtime possible in the living room, the backyard, and the pool. This chew toy also features a unique squeaking sound when bitten into, which can be extremely entertaining for dogs and undeniably annoying to owners. The chewable nature of the toy can help redirect dogs attention from their destructive chewing behavior. This cute dog toy is as aesthetically pleasing as it is practical. The 100% cotton exterior is environmentally friendly and machine washable. This toy comes in a vibrant yellow color and shaped into a giraffe. The interior is made up of a rope chew toy rather than a typical polyester stuffing. While this toy is not suitable for large and powerful chewers, it can be the perfect chew toy or tug-of-war toy for small to medium dogs. Like any chew toy, it can help redirect destructive behavior. This toy is a unique take on the typical rope chew toy. Most rope chew toys consist of a woven rope material with one to two knots at each end. Instead, this toy is one large knot made up of colorful woven cotton material. The toy is about four inches around, making it well suited for small to medium dogs. The round shape makes it great for games of fetch while the durable rope material makes it a great chew toy. The toy is not made for both indoor and outdoor use, however, as it is not that easy to clean. This toy comes from one of the most highly regarded dog toy brands on the market. This unique and meticulously crafted toy is both versatile and durable. The toy is a tennis ball on top of a squeaker ball, covered in a durable nylon fabric material with four long nylon tails hanging off the ends. The nylon material is very high quality and durable, letting your dog to chew the squeaker ball and tennis ball underneath without tearing them apart. The long nylon tails are designed for easy pickup and tug-of-war. The sturdy nylon exterior is easy to spot clean making the toy suitable for both indoor and outdoor use. This plush cotton toy is designed to look like a mallard. Hunting dogs or hunting puppies in training will love it. The toy features a loud squeaker which may get on your nerves, but your dog will love it. The plush exterior makes the toy well suited for indoor play, but not outdoor play. It is worth noting that this toy can be easily destroyed by aggressive or large dog breeds. The mallard is recommended only for small to medium breeds or puppies. All the entries on our list are high quality yet cheap dog toys that your dog will love. Our review shows that some are better suited for certain styles of play and breeds. 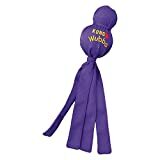 Frugal dog owners want a cheap dog toy that is durable, can used for both indoor and outdoor play, and can support both interactive and solo play. With these factors in mind, in our opinion, the KONG Wubba Dog Toy takes first place despite being pricier. The durability, versatility, and unique design make this toy second to none.